Pac-Man: Takes to the Streets of Tokyo ~ Get Your Daily Dose Of Buzz! If you are in Tokyo over the holidays there is something very cool that you will want to ride. It’s one of those rickshaws you sit in and the dude with massive leg muscles runs you around the city. 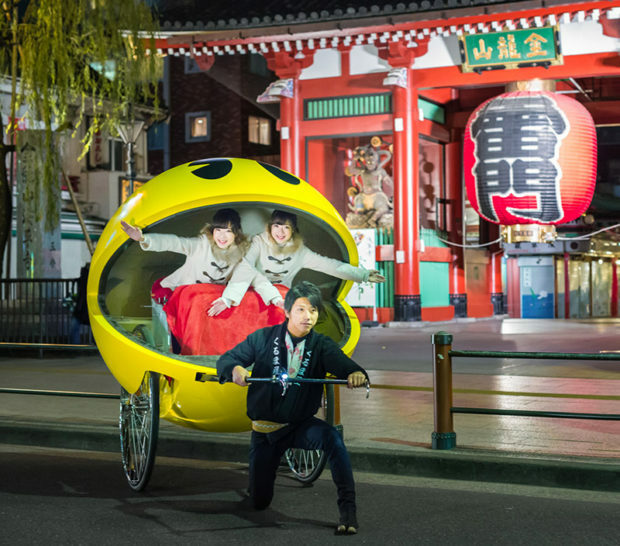 Only this rickshaw isn’t a basket that you sit in, it looks like Pac-Man. You sit inside his mouth and I assume you can make the wakka-wakka-wakka sound effects all you want. The ride starts around the Komagata Bridge and takes passengers around Asakusa to see the sights.